Good evening friends, thanks for visiting my little card spot. I hope you like it here and will come back often. 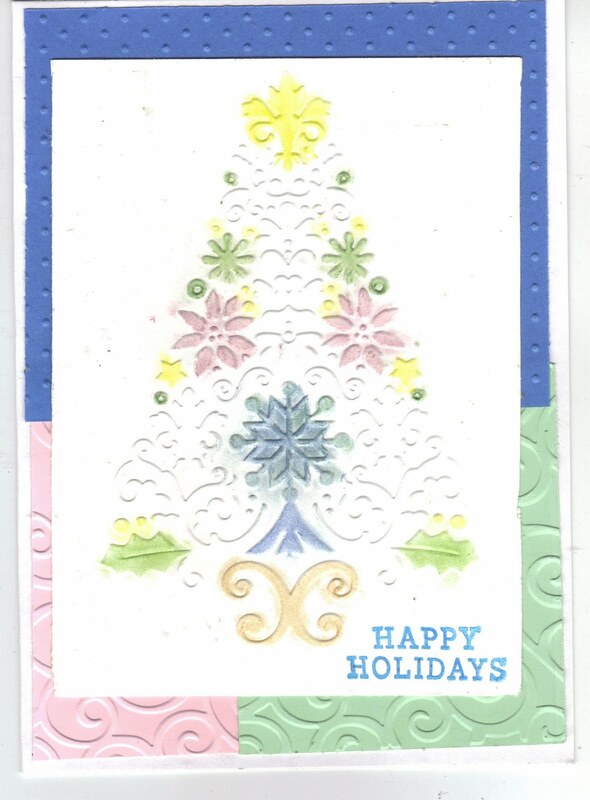 Think this simple embossed tree fits the bill. Card is done on white CS Overlaid with blue, pink and green run through the cuttlebug. The Christmas tree is also from a cuttlebug folder, I colored parts of it with Pebbles I Kan'dee chalks. Please leave me a comment, they mean a lot to me. Hi Judie - I've been away for a few days so I'm a bit late blog hopping this week. Love how you have used the Cuttlebug tree folder - just colouring a few parts of it with chalks is very effective. I've not done that but it's something I must try. Thank you for sharing with us at Bah! Humbug! Hope you'll join our new challenge that starts tomorrow. Super card Judie. I love that tree folder after buying it last year. I think it's going to be a favourite every year as it makes such a lovely focal point. Pretty card Judie. I really like that tree cuttlebug folder and the way you colored it makes it even nicer. Wow I love your card, as you have used my favourite Christmas embossing folder. What a fantastic idea to colour the baubles on the tree. Love the way you used that folder...very pretty.